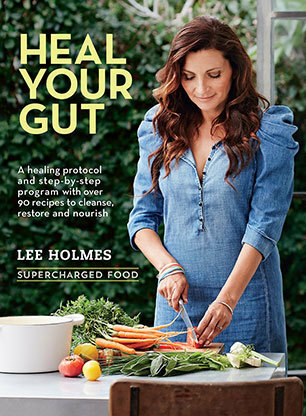 Lee Holmes firmly believes the origin of health starts in our guts; she demonstrates this through her latest book "Heal Your Gut". "Heal Your Gut" is an interactive cookbook that will gently guide you through a path to optimal health, everything you ingest has a huge influence on your mood, energy levels and immune system. What we eat doesn't just influence our internal health,; it also shows on your skin, nails, hair and outer glow, or lack of, with so many fad diets and eating plans which ban certain food groups; it can be difficult, confusing and very time-consuming to eat right and remain on a healthy path in the long term, luckily for everyone searching better nutrition; Lee Holmes has condensed a whole lot of recipes, for any season, including all sorts of food! This book starts off with an easy and quick explanation about the importance of a happy gut; good and bad bacteria, food additives, fermented foods, how to follow and create meal plans, how to curb your cravings. Unlike other health cook books; Heal Your Gut has a practical and family friendly approach (recipe names are only a few words and all require easy to purchase ingredients), there is no snobbery or great difficulty in preparing any of the dishes. Heal Your Gut contains weekly meal planners with 6 small meals a day, it also gives you tips on how to meditate, how to create a healthy home/workplace, dry skin brushing and other relaxing activities that will compliment your new eating habits. Recipes are categorized into drinks (morning elixirs, energy tonics, sleep time teas), soothing broths and healing soups follow, then easy to digest meals in a bowl (also easy to buy ingredients for), the fermented vegetables section is quite interesting as you can learn to make your own Kimchi, Sauerkraut and even Kombucha! of course this would not be a true cook book without a desserts section, of course without all the excessive amounts of sugar and processed fats... think more lovely textured tapioca pudding or delicately flavoured avocado ice cream! If you are thinking of not only dieting but becoming serious about the way you eat; this book will not only set the bar high for anything you ingest, it also will improve your relationship with food and it's interaction with your body will become gentle, soothing and nourishing!